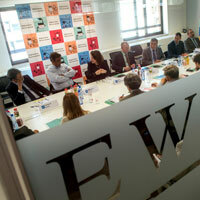 The EastWest Institute’s Brussels Center convened a roundtable discussion on “Afghanistan in Transition” on June 11. EWI organized the event to assess the county’s current political and security transitions prior to the final round of presidential elections on June 14 and to launch the institute’s latest report, Afghanistan Reconnected: Regional Economic Security Beyond 2014, which focuses on the great economic opportunities and regional challenges the transition offers. The ambassadors of Afghanistan and Tajikistan; senior diplomats of permanent missions of foreign states to the European Union; and representatives of the European Union, science-policy research centers and non-governmental organizations attended the roundtable. Panelists, including the Economic Minister of the Pakistan Embassy Dr. Safdar A. Sohil. 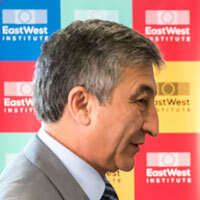 applauded the report and EWI’s effort to stimulate regional economic cooperation. 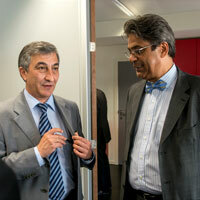 Ambassador of Afghanistan to the European Union, Belgium and Luxembourg, H.E. Mr. Homayoun Tandar, tackled the issues first, stressing that Afghanistan’s security situation has improved, and that the country offers great opportunity for investment and regional cooperation. Tandar emphasized that the Afghan security forces are capable of ensuring security for future investment in Afghanistan’s untapped natural resources, notably gas and mining. The security provided by the Afghan security forces in the first round of elections was a good sign of their capabilities according to Ambassador Tandar. “In a relaxed atmosphere, roughly 7 million of Afghani have cast their votes on the April 4 first round of elections; at least the same number of people took part in last Saturday’s, June 14 second round,” said Tandar. 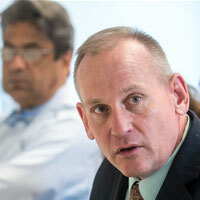 He noted, however, the challenge will be to financially support the security forces, as they will take full responsibility from the International Security Assistance Force (ISAF) on December 31, 2014. Tandar also stressed that the cooperation with Pakistan is crucial for regional economic development and stability. H.E. Mr. Rustamjon Abdulloevich Soliev, ambassador of Tajikistan to Belgium, the Netherlands, Luxembourg, the European Union, NATO and UNESCO then proceeded to express the position of Tajikistan, a neighbor to Afghanistan with 1400 kilometers of common borders. There are number of initiatives and projects where Tajikistan can help Afghanistan navigate through economic transitions. In the energy sector, Tajikistan can be a reliable energy supplier to both Afghanistan and Pakistan. The CASA-1000 regional project allows Tajikistan and Kyrgyzstan to sell surplus hydropower to Afghanistan and Pakistan. Afghanistan’s infrastructures and transport systems are essential to boost its trade and to take full advantage of its key location as a landbridge between South and Central Asia. Dr. Safdar A. Sohail, economic minister, Embassy of Pakistan to Belgium, underlined that Afghanistan’s position should allow it to become a transit road from Europe to China. No country should be excluded. Solving common issues by dialogue is still a challenge, with zero-sum game thinking still prevailing. These roadblocks need to be overcome. It will be otherwise impossible to move common projects forward in any meaningful way. At the conclusion of the event, a Russian delegate affirmed that the stability and security of Afghanistan is in the national interest of the Russian Federation. The delegation said that their country is ready to share the burden of participation in regional projects aimed at stabilizing Afghanistan and the countries around it. Final remarks highlighted agreements among participants on the need for trust and confidence building in order to secure foreign long-terms investments. All agreed that a tremendous potential for energy and trade is possible, but the lack of local funds and resources could hamper full economic development, both internally and regionally, with negative consequences for all players involved. Click here to read Afghanistan Reconnected: Regional Economic Security Beyond 2014.